Puma is the youngest member of our family. She is a Croatian Sheepdog. At least we think she is. Our neighbor Dominika found her at a parking lot in Croatian coastal town of Vodice and rescued her. Now she is our little lady. Our son Niko adores her and they will become a great pair growing up together. We went to Maribor this Sunday. 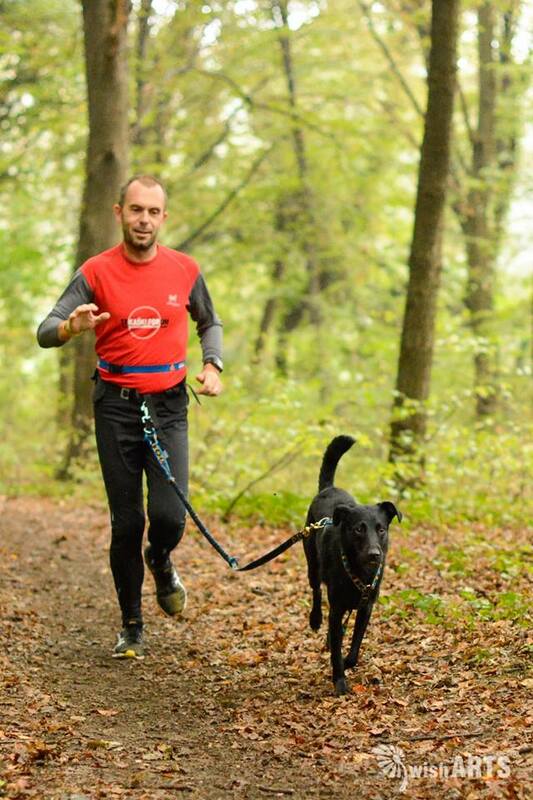 Our friends Beti and Patrik were the organizers of a canicross race. Canicross is a sport discipline where you run or bike with your dog. You are tied together with a leash and try to be as fast as possible. A good canicross dog pulls you so fast that you can hardly turn your legs or pedal your bike to keep pace with her. Greyhounds and pointers excel in this sport. The race was called 1st Dryland Race Maribor 2013 and was held in Stražun forest. The track was weaving through this beautiful little forest for good four kilometers. It was a misty and rainy morning. The paths were slippery and covered with tree roots and early autumn leaves. It was our first real race and were just two curious participants of a fairly competitive event. Other pairs of runners, bikers and dogs took it far more seriously. A competitive canicross dog has to pull constantly with full strength and speed. Which Puma wasn’t doing at all. We just ran along. Actually at the end I had to pull her to keep up the pace. It was fine with me and with her and we both enjoyed it a lot. Our result and placement did not really matter. We had fun. We were together. Puma is a year and a half old and she really needs to run. So it was a good thing to do for both of us. Will we do it again? In a competitive way that is? I think we will. Maybe she will learn how to pull while running but it’s not really important. 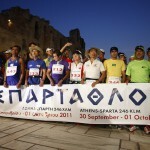 Important is that we are doing something which we both love to do – running. It is a bonding experience – literally and metaphorically. And when Niko grows up enough they will be a great canicross pair. We look forward to these days very much. Photo by Grega Toporiš Bohinc. Published at FB page of 1st Dryland Race Maribor 2013. Ervin is a husband, father, a dog person and a runner who loves to run far (and slow). He is a founder of The Running Forum Slovenia and an editor of several websites including Ultrarunning Slovenia - a tribute to Slovenian ultramarathoners. Great article Ervin! Sounds like a wonderful dog and hope you enjoy many years together. Thank you, Linda. We will and I am looking forward to it with great joy. There’s so much joy in your photos and the way you write. The bond between dog and racer sounds like something I would love to experience in such an event. Beautiful writing – thanks for sharing the joy! Dear Susan, thank you very much for your comment. It is important to have pets for this reason. They provide a special type of comfort and bonding that you cannot do with humans. They are awesome companions to have. Thank you, Miriam, for pointing this out. Pets, dogs especially, have been always a very important part of our family. At this moment we are together with Tobi, a twelve and a half years old yellow Labrador, and with Puma. Thank you, Gertraud. Yes, to be with your loved ones and to do things together is all that matters. Thanks for expanding my horizons a bit. I’m not familiar with this sport at all, so it’s been great reading about your experience with it. But most of all, I loved reading that you kept the competition in perspective with the desire to do what you love with Puma. You have fantastic scenery there, great places to run! You’ve enlightened me too with this sport, Ervin as I’ve never heard of it before reading your article. I love dogs and although I don’t have one myself right now, I have had dogs in the past and I’m fortunate enough that I have 3 grand-dogs in our family. This sport sounds ideal for all the reasons you’ve highlighted. I wish you much fun during your next adventure with energetic Puma. Dear Cathy, thank you. Give your dogs a good scratch in my name, would you. There is a race in Tarvisio, Italy in two weeks time. I guess we’ll participate in a noncompetitive event. I’ll keep you posted…. It’s great when there is teamwork – doesn’t matter if it’s with humans for fur babies. As long as you work together and you love what you are doing, you can accomplish anything. Michele, thank you for pointing this out. Yes, teamwork. And I will never force Puma to run with me if she doesn’t feel like it. For now she is always eager to go for a run. What a lovely idea! I have not heard of canicross before, but I have a few friends where I live who might be willing to try this new (to us) sport. We are a very active group of people who enjoy (either as participants or spectators) snorkeling, scubadiving, hiking, 5K, aquathon and even marathons. I look forward to introducing this activity, and the bonding it will foster. Van, thank you very much for your comment. This sport is quite popular in Europe. You might be more familiar with winter varieties like sleds.